The digital camera has made the instant camera obsolete. These days we take pictures on our phones and show them on screens. Or has it? Being able to give somebody a print right then and there can be handy, especially if you are sharing with somebody who does not have a smartphone and is not tech savvy. Plus, there is something about instant film cameras that has a kind of nostalgic charm to it. These days, though, they can be hard to find – and film for them can be even harder to find. If you use an instant film camera, then you only get that print to hand out…fine if you want to share something with only a few people or keep it to yourself. In this day of Instagram, though? The answer is a hybrid digital instant camera. These are basically digital cameras with a small printer that produces the photograph on special paper, whilst also storing it on a memory card ready to send out to all of your Facebook friends. You can make multiple print copies – and while the copies produced are smaller than those you would get from taking it home and using a full-sized printer, you can give them to somebody right there and then. Here are seven options for digital instant cameras or similar devices to choose from. Unsurprisingly, the company that makes the most digital instant cameras? Polaroid. This is their business plan for the modern era and five of the seven cameras featured in this article are Polaroids. The Polaroid Snap is a basic, classic instant camera designed to be carried in a small purse. It produces 2 x 3″ prints using Zink paper. Zink paper is heat activated and has no ink in it and is quite similar to classic Polaroid paper, except without the shaking and with a peelable sticker back that makes these pictures perfect for collaging or to use as labels. The Snap offers a 10 megapixel camera and 32 gigabytes of storage on a MicroSD. It comes in four colors – white, black, blue and red. A major downside is that the prints are expensive – each sheet of Zink costs about 50 cents (this is true with the other Polaroid cameras as well) and it does not have a flash or a zoom. Also, according to Cnet, the rechargeable battery is not user replaceable. The Snap Touch is an updated version of the Touch. It uses exactly the same printer technology, but has a rather better camera – 13 megapixels rather than 10 – and can store up to 128 gigabytes. This updated version is a distinct improvement in use too. It has a 3.5 inch LDC touchscreen to preview your photos, can be put in black and white and vintage sepia modes, records 1080p HD video (which will quickly eat up that extra storage space) and is bluetooth capable. It comes with a self timer and selfie mirror, and has a photo booth mode that takes six shots in rapid suggestion. The bluetooth capability means you can also use it as a photo printer for your phone or tablet. A partner app lets you use your phone to edit pictures. Oh, and they added two colors – purple and pink. This is similar to the Snap, but adds 720p video and a 6x digital zoom – which makes framing photos a lot easier. It also has a flash and a USB port for wired uploading. The Z2300 is now several years old, and some of its technology is a bit out of date. It is closer to a “real” camera, though, with manual control over ISO, white balance, exposure, etc. However, it has no manual focus – you can only change between landscape and macro settings. This uses the same Zink 2×3″ photo paper. According to one reviewer, it is worth noting that the instruction manual is included only on a CD, and that CD, at least when the camera was first released only plays on PCs. Where the Z2300 above sports a relatively modern look, the Z340 takes a trip back in time to the wedge-shaped design (if viewed from the side) of older polaroid cameras. This camera is indeed a bigger brother of the Z2300, sporting a 14 Megapixel sensor as opposed to the 10 Megapixels on the former. Although the Z340 has a slightly smaller LCD screen, it can print the larger 3×4″ prints, as opposed the 2×3″ snaps of the Z2300. Like the Z2300, it can also record 720p video, but would you really shoot a lot of video on an instant camera? Claimed battery life is good for 75 shots with flash plus 25 prints, so you ought to get a lot of action from a fully charged battery. Unfortunately this is not the fastest camera on boot-up times and shot-to-shot recycling. This is a fuller featured digital instant camera that is essentially the replacement for the two listed above. It has a 14 megapixel camera and also a 2 megapixel forward facing lens on the touchscreen side. It has bluetooth and WiFi connectivity and built-in GPS for photo tagging – basically making it a low end smartphone without the cellular function. It has 4GB internal storage and will take microSD. As it runs stock Android, it will run whatever photo editing app you prefer, making it much more versatile than the simpler Snap. It can also be used to play games and run any Android stuff that does not need cell connectivity. It uses the same Zink technology to print 2 x 3 prints. Oh, and it looks like a real life version of the Instagram logo. According to their own site, the I-1 “reinvents the original instant camera.” Their project was designed to preserve Polaroid’s original process, which Polaroid has now replaced with Zink. So, it is actually more like a Polaroid than the Polaroid cameras listed above. Modern technology has been adopoted as well – it comes with Bluetooth functionality and a companion app. 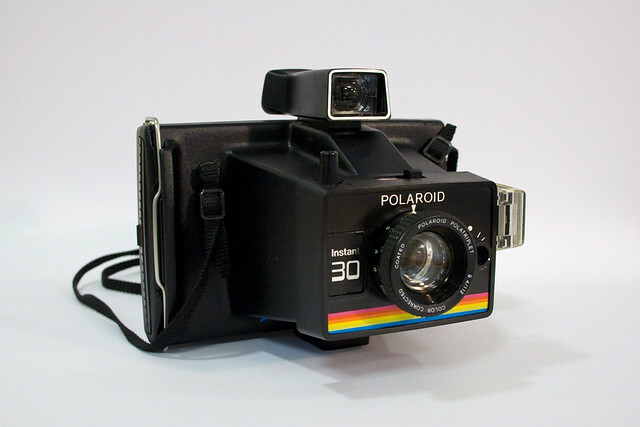 The downside is that it will not slip into your purse the way the flat polaroid cameras will. The upside is that it has a lot of “real camera” features, especially with the companion app. It also has a ring flash – a feature not often seen. It also focuses very much on the instant film part – while the Polaroid cameras are digital cameras that print, the I-1 is an instant film camera you control digitally and does not seem to have the social media capability of the Polaroids. It also looks like a vintage camera. It is aimed at people who like instant cameras, and has a steep learning curve. Prynt is not a camera. It is a photo printer that uses Polaroid’s Zink paper – built into an iPhone case. (Sadly, there is as yet no equivalent for Android – their website claims the Galaxy is supported but this appears not to be on sale yet – and the Prynt is not yet available for the iPhone 7). Because it relies on your phone’s camera, you are taking photos of the same quality as normal and, of course, don’t have to carry a separate camera around. However, the case is almost as bulky as the Polaroid Snap and has to be charged separately from your phone. Oh, and it also has another quirk – if you look at the physical print through a phone with the Prynt app installed it turns into a Harry Potter wizard photo on the phone’s screen. To be honest, though, unless you love your phone camera’s capability, one of the Polaroid cameras is better. Of the options available, the best one is probably the Polaroid Z340 (although somewhat dated by now), the Socialmatic or, if you are on a budget and don’t mind a very basic camera, the Snap Touch. The I-1 and Prynt are novelties that might suit you if you fall into a certain niche.